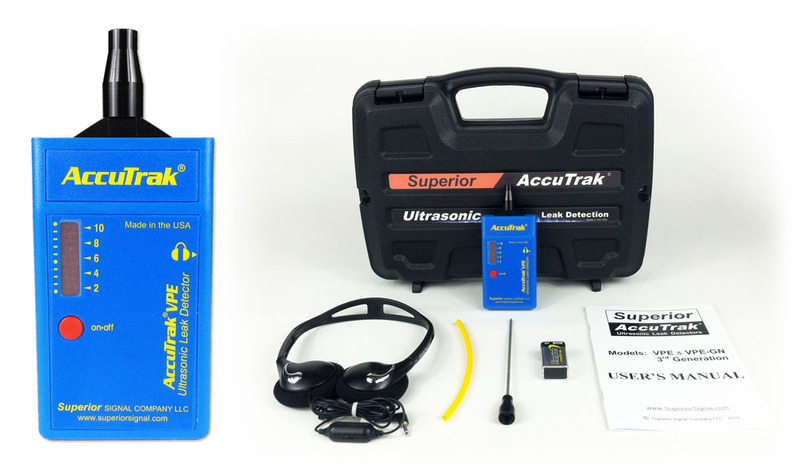 Superior Signal Company is proud to announce the latest version of our most popular ultrasonic leak detector – the 3rd generation AccuTrak® VPE. Featuring ALL-NEW internal circuitry, the improved AccuTrak® VPE stands out above all other ultrasonic leak detectors in its class. With even greater sensitivity and a number of new features unique to the VPE, no competitive ultrasonic leak detectors even come close. The Patented Superior AccuTrak® VPE Ultrasonic Leak Detector is a state-of-the-art, non-invasive, ultrasonic leak detector that can detect both pressure and vacuum leaks of ANY GAS. The AccuTrak® VPE is ideal for pinpointing leaks in air conditioning, refrigeration, automotive and other systems. AccuTrak® Ultrasonic Leak Detectors are extremely sensitive to the ultrasonic sound of a turbulent gas leak. Using a technology called "heterodyning" they translate ultrasound to a lower frequency which your ear can interpret. 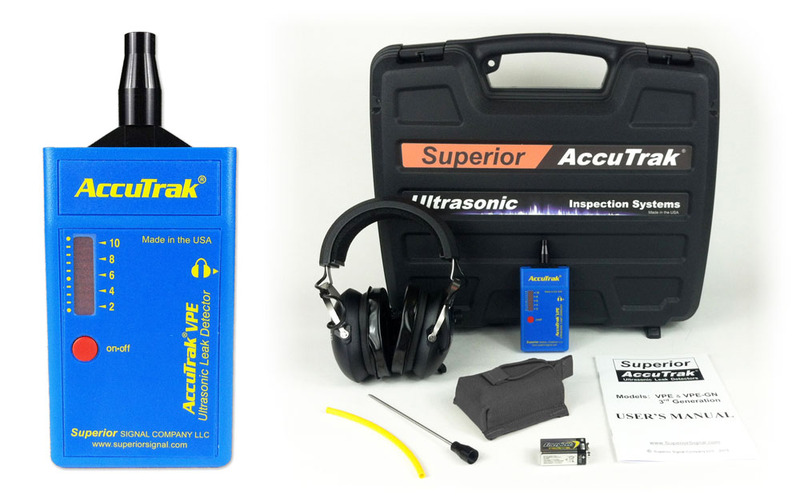 AccuTrak® Ultrasonic Leak Detectors maintain the original sound characteristics of the ultrasound making it possible to distinguish leaks from other competing background sounds. AccuTrak® Instruments are so sensitive you can actually hear the blink of an eye, yet most background noise will not interfere with detection accuracy. More Rugged Design – internal components have been redesigned to make the leak detector more shock resistant, resulting in an even more reliable design. Whether you only need the basic functions of the VPE or you plan to take full advantage of the instrument's diverse capabilities, we have a kit that will meet your needs! Click the "Find Your Kit" tab above to learn more. AccuTrak® VPE is a much more accurate and reliable instrument for detecting single and multiple leaks. AccuTrak® VPE can detect any type of refrigerant gas including nitrogen. AccuTrak® VPE detects both vacuum and pressure leaks. AccuTrak® VPE is effective in gas saturated areas and under windy conditions. AccuTrak® VPE does not require the introduction of tracer gases into the system, which can be ozone depleting when vented, and can also be harmful to ones health. AccuTrak® VPE is #1 in technology. We wrote the book on ultrasonic leak detection, our patented instruments lead the industry! AccuTrak® VPE is the original! it is not a copy. 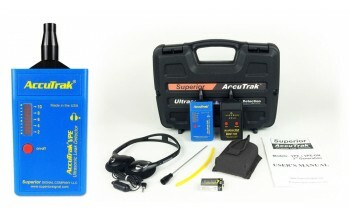 AccuTrak® VPE is the most durable unit available, with the best warranty. The face of the unit is sealed with no pin holes/speakers for foreign objects to enter. AccuTrak® VPE has more dynamic range, and wont overload in loud areas. AccuTrak® VPE gives true audio sound reproduction instead of the "beeps and squeals" of other instruments. 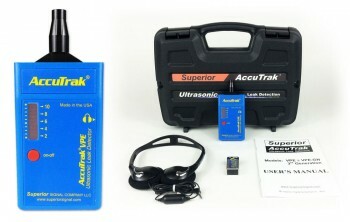 Superior AccuTrak® advanced patented technology has never been so affordable! 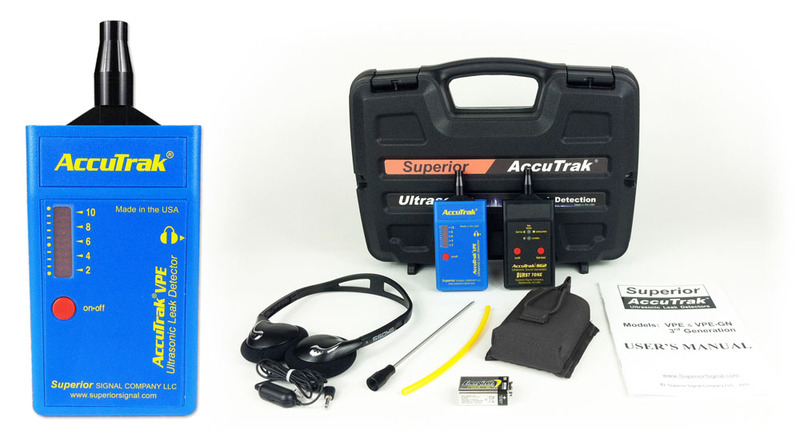 The AccuTrak® VPE Basic Kit is for technicians who require only the essentials to detect leaks using airborne ultrasound. As with all AccuTrak® Leak Detectors, the VPE finds leaks of any kind of gas or refrigerant without changing tips or components. Works equally well to find compressed air leaks, nitrogen leaks – even vacuum leaks! AccuTrak® Ultrasonic Leak Detectors can find leaks as small as the equivalent of 1.5 oz per year of refrigerant, or can hear a 5 psi leak up to 30 feet away. The AccuTrak® VPE Standard Kit offers literally twice the functionality of the Basic Kit with the addition of the AccuTrak® Touch Probe and Waveguide. Utilizing the Touch Probe, the VPE can troubleshoot thermal expansion valves in less than 5 minutes, and find faulty steam traps in just seconds! The Touch Probe can also be used to detect worn bearings and faulty valves. With the Waveguide attachment a technician can gain better access to hard-to-reach places and better determine the location of leaks that would otherwise be inaccessible. This is our most popular kit for a reason! The AccuTrak® VPE Plus Kit is designed for technicians looking to take full advantage of all the VPE’s many capabilities. The VPE Plus Kit includes everything in our Standard Kit – PLUS a convenient Belt Pack and our powerful Burst Tone Sound Generator! The sophisticated Burst Tone can artificially pressurize any vessel or space with ultrasonic sound, allowing a technician to quickly scan for leaks even where there is no actual pressure differential! The VPE Plus Kit is ideal for technicians who test refrigerator door and window seals, or any other non-pressurized seal or vessel. The VPE Plus Kit is also great for Energy Audits and Surveys, and finding air leaks and sources of air infiltration in homes, aircraft, ships, and buildings.